Bottom-line, what do I need to know about B12? No two ways about it--you need it for healthy nerves, DNA, and red blood cells. B12 is commonly found in animal products, so if you aren't eating animal products you need to take a supplement or eat fortified foods. You can find B12 in fortified foods like soymilk, breakfast cereals, nutritional yeast, or meat substitutes--but the most convenient source is through a vitamin B12 supplement. When it comes to food sources, you better look at labels carefully--I had a hard time finding B12 listed on many labels. 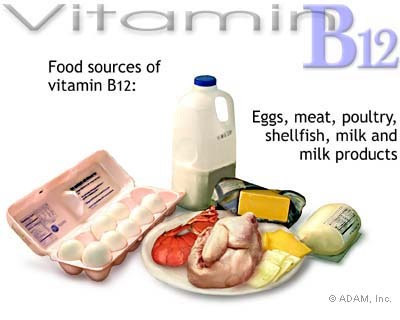 Barnard says it is absolutely essential to "include a reliable source of vitamin B12 in your daily routine." And don't expect to find active or adequate B12 in spirulina, tempeh, seawood, or miso. How much B12 do I need if I'm eating plant-based? Dr. Esselstyn's B vitamin expert recommends that if you are on a plant-based/vegan diet you should take 1000 mcg of B12 a day. Son, Rip Esselstyn recommends 500 mcg of B12 taken under the tongue or chewed. Dr. Neal Barnard says, "If you've had no B12 in your diet for a few years, daily doses of around 1000 mcg are advisable." The Institute of Medicine recommends that everyone over the age of 14 get 2.4 mcg of B12--roughly the amount found in 3 ounces of beef. That's the minimum amount needed to prevent anemia. (for a list of the amount of B12 found in different foods, click here) The Daily Value set by the FDA is 6 mcg (based on a 2000 calorie diet)--2 1/2 times that amount. But hold on a minute--1000 mcg compared to 2.4 mcg is a huge difference? What's up with that? Rest assured, "the Institue of Medicine has no established upper limit for B12, because of its low potential for toxicity." In the HOPE 2 Trial, 1000 mcg of B12 administered to over 5,000 adults for 5 years produced no toxic effects. My comment: After reading about the benefits of a high normal B12 intake, it just may turn out that those low ball Institute of Medicine/FDA B12 recommendations may start looking way too low--just as the DRI for vitamin D is now looking. Key fact: Under the best of circumstances, healthy people only absorb 56% of each microgram of a vitamin B12 supplement they take! The NIH fact sheet goes on to say, "Only about 10 mcg's of a 500 mcg oral supplement are actually absorbed in healthy people." So you can connect the dots yourself. If you are over 50, and have any of the conditions that cause poor absorption of vitamin B12--and you're not eating animal products--it's easy to fall short in the vitamin B12 department. 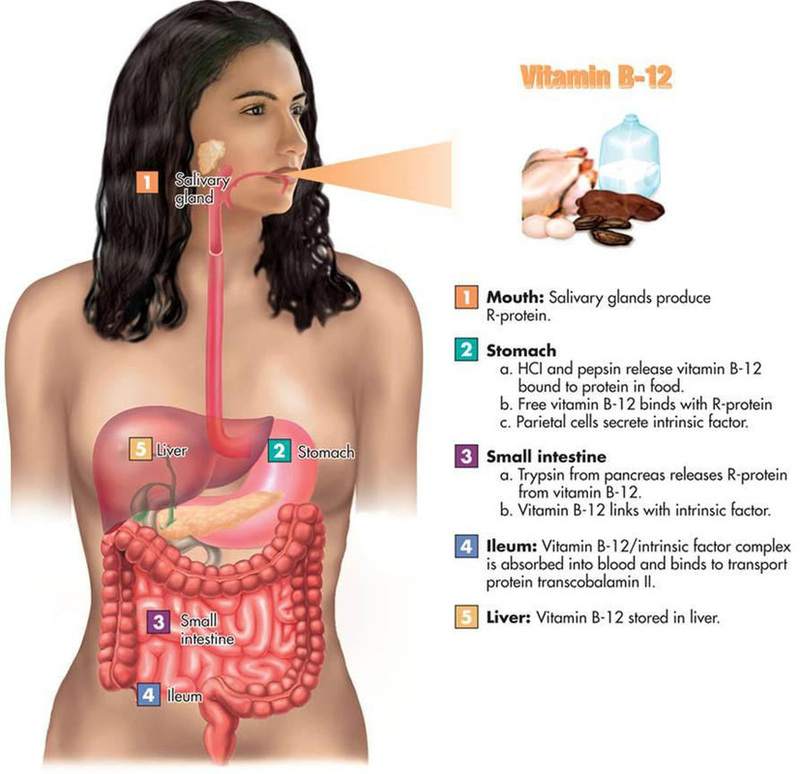 Source: Carmel, R. "How I treat cobalamin (vitamin B12) deficiency." Blood 112:2214-21, 2008. Click here for the article. Click here for Table 1 with the absorption rates. Vitamin B12 Absorption Problems. Turns out, there are many reasons why even non-vegans have trouble getting enough B12. The list is long: Celiac disease; Crohn's; any kind of gastrointestinal surgery that removes part of the stomach; not producing enough hydrochloric stomach acid (a condition that affects 10-30% of older adults); being over age 50 or 60; taking any of the common medications for gastroesophageal reflux or peptic ulcers; or taking Metformin, a common diabetes medication. According to the National Academy of Sciences/Insitute of Medicine everyone over age 50 (omnivore, carnivore, vegan) should take a B12 supplement or use B12 fortified foods. What's so special about the over 50 set? About 10-30% of older meat eaters--and even some younger ones--are vitamin B12 deficient because of poor absorption. The older we get, the harder it is to absorb B12. As Barnard explains it: Some people's stomach cells don't produce enough of a compound called, Intrinsic Factor (IF)--and you need enough of it to absorb B12. The all-too-common medications like the proton pump inhibitors & H2 receptor antagonists, better known as Tagamet, Nexium, Pepsid, and Prilosec can interfere with production of IF, and consequently, vitamin B12 absorption. ● Look for a supplement labelled as "Methylcobalamin". ● Consider taking 500-1000 mcg of Vitamin B12 if you're eating plant-based or vegan. Consult your doctor. ● Vitamin B12 expert Dr. Ralph Carmel advises taking B12 on an empty stomach, rather than after a meal, for better absorption. ● It's reasonable to ask your doctor to check your B12 level if you are over 50 years old, are a vegan, or rarely eat animal products. ● According to Linda Antinoro, J.D., R.D., "Synthetic B12--found in supplements and fortified foods like cereals--doesn't require stomach acid for absorption, so it is particularly suited for older people." What happens if I don't get enough Vitamin B12? It can take years for a deficiency to show up. Here's how a B12 deficiency can manifest itself. •Nerve damage that causes numbness & tingling in the hands & feet. •Neurological symptoms of dementia, poor memory, and soreness of the mouth & tongue. A simple blood test can test for B 12 deficiency. If a plant-based diet is supposed to be so good for us, why doesn't it naturally provide enough B12? This was a surprise to me. B12 isn't actually made by animals! It's made by bacteria that's found in the gut of animals--and it passes into the animal's flesh. According to Barnard, the human digestive tract also produces B12, but it's produced too low in the digestive tract to be absorbed. Indigenous plant-based cultures were not vitamin B12 deficient--they got enough vitamin B12 straight from the bits of dirt left on the vegetables and root crops they ate. I guess that's one advantage of not having running water and adequate sanitary conditions--but I'll pass on that one. Barnard's take on this: "Just as most of us don't get enough sun and need vitamin D, most of us aren't surrounded by B12-producing bacteria and need a supplement." Any added benefits from getting enough Vitamin B12--like being on the higher-side of normal? ● Prevent Brain Shrinkage. -- "A high B12 status helps you maintain a healthy brain," according to Anna Vogiatzoglou, M.Sc., R.D., a researcher participating in a recent University of Oxford study. This study found that people with lower, but still normal levels of B12 were six times more likely to exhibit brain shrinkage than those with the highest levels. The low-B12 group lost twice as much brain volume on average than the high-normals. "Even though the sample consisted of subjects with relatively good vitamin B12 status, the study was able to find a strong association of vitamin B12 markers with brain volume loss," the researchers concluded. According to Dr. Susanne Sorensen, MD, of the Alzheimer's Society of the UK, "Shrinkage is usually associated with the development of dementia.." Note: this was an observational study of 107 people followed for 5 years. Stay tuned for more clarification of the B12-brain shrinkage connection through larger clinical trials. Neurology. 2008 Sep 9;71(11):826-32. "Taken as a whole, our data suggest that subclinical low vitamin B12 status, within what is usually considered to be the normal range, can affect brain volume even in the early stages of cognitive decline, possibly by disturbing the integrity of brain myelin or through inflammation. 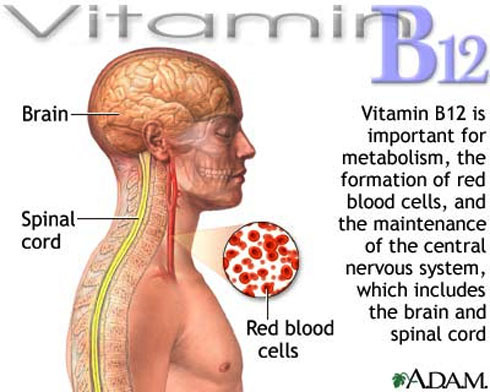 Thus, early treatment of low vitamin B12 status may prevent further brain volume loss." Conclusion of Neurology article, "Vitamin B12 Status and the Rate of Brain Volume Loss in Community-Dwelling Elderly." ● Prevent Depression. A National Institute of Aging study found women with low B12 levels were more than twice as likely to develop depression than those with normal B12 levels. Research from Spain also confirmed the connection. The latest research on the subject was published in the American Journal of Clinical Nutrition, in a study that looked at 3,500 seniors over 12 years. For each additional 10 mcg of vitamin B12 taken, depression was decreased by 2%--and the benefit was only observed in those getting their B12 from supplements, not from food sources. The authors said that over age 60, B12 from food is harder to absorb. Am J Clin Nutr. 2010 Aug;92(2):330-5. Epub 2010 Jun 2. ● Bone Health. The Framingham Offspring Osteoporosis Study found those with low B12 levels had lower-than-average bone mineral density. B12 appears to aid the bone-building cells (osteoblasts), as well as lowering homocysteine levels, which, at high levels weaken bones. J Bone Miner Res. 2005 Jan;20(1):152-8. Epub 2004 Oct 25. ● Decrease in invasive cancer & breast cancer in women over age 65. Harvard researchers studying women over age 65 supplementing with high vitamin B12 doses (1000 mcg) were 25% less likely to develop invasive cancer of any kind, and 38% less likely to develop breast cancer. It's hypothesized that B12's role in making DNA is responsible--and the fact that older people need more B12 because of their reduced ability to absorb it. Note: this benefit was only seen in women over age 65. JAMA. 2008 Nov 5;300(17):2012-21. ● Age-related macular degeneraton. The same Harvard study found a 34% reduced risk in age-related macular degeneration for women aged 40 and older when supplementing with 1000 mcg of B12. Arch Intern Med 2009 Feb 23;169(4):335-41.